The 2012 Hyundai Veloster is selling fast as pricing on the 2013 Hyundai Veloster Turbo has been officially announced by Hyundai Motor America. Hyundai Motor America has officially announced pricing for the 2013 Veloster and Veloster Turbo. The base 2013 Hyundai Veloster starts at $17,450 with the six-speed manual and $18,700 with the EcoShift dual clutch automatic. The 2013 Veloster Turbo will be priced at $21,950 for the manual and $22,950 for the automatic with Shifttronic. Destination charges for both will be $775. The Hyundai Veloster Turbo is being introduced at a time when many U.S. dealers can’t keep up with the demand for the base model. "Availability is tight, the car is in high demand," said Krafcik. "It's like Apple with iPhones. They aren't sold out, but they are hard to get. We're still in that wonderful phase. We are literally selling the cars as they come off the car carriers." The Veloster isn’t the only car Hyundai Motor America can’t seem to keep up with the demand. Their Sonata and Elantra sedans that are produced in the U.S. are selling so fast that close to one thousand new workers have been added to keep up. With this kind of pricing on the 2013 Veloster Turbo, the new car will be wildly popular and Hyundai could have another problem with production. The 2103 Hyundai Veloster Turbo will use the a 1.6-liter direct-injection four-valve four-cylinder engine that will produce 201 horsepower with 195 foot-pounds of torque. The engine will utilize a twin-scroll turbocharger to get the optimum power from the 1.6-liter gasoline engine. This is a substantial 63 horsepower increase over the naturally aspirated standard Veloster engine. The 2013 Veloster Turbo will deliver a class-leading weight-to-power ratio of 14 pounds of car for each horsepower. Hyundai says that when the final EPA ratings are posted, the car will deliver an estimated 27/38 city/highway miles per gallon using regular unleaded gasoline. The twin-scroll turbocharged engine will be mated to a Hyundai-built six-speed manual transmission or a six-speed automatic with paddle shifters mounted to the steering wheel. The Veloster Turbo will get a specially tuned exhaust system and will be louder than the standard 1.6-liter Veloster engine. The Turbo version's suspension with get McPherson struts in the front and a V-beam axle in the rear. The sport suspension adds 24-millimeter front and 23-millimeter rear stabilizer bars for flatter handling. Tires on the Turbo are Korean Kumho Solus P215/40R18s wrapped around 18-inch alloy wheels. The chassis will be upgraded with a quicker steering ratio and revised calibration for the electric power steering system. Outside, the Turbo package will get a special matte gray paint, the first matte paint ever used on a Hyundai product. The 2013 Turbo model will be distinguished by a unique front fascia, fog lights, its own projector headlamp design with LED accents, unique LED taillamps, and side mirrors with built-in turn indicators. 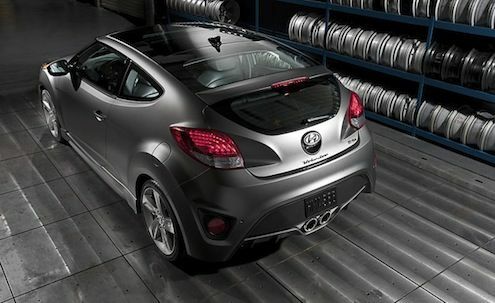 With the way Hyundai has priced the new 2013 Veloster Turbo, it looks like the South Korean automaker could be facing more production issues. I really like the Veloster, having test drove one a few months ago (I happenned to luck out as my local dealers rarely have any in stock as they are selling very well here). Honda really could learn a lot from Hyundai as the only two features that the CR-Z has over the Veloster is it has HID lights and a better 6 speed manual ). Now, if only Hyundai would add HID lights, and improve the 6 speed manual in the turbo Veloster -- the Cr-z would have absolutely nothing to offer over the Veloster.